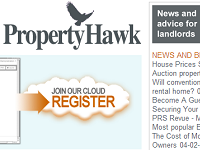 Property Hawk is the UK's #2 website for landlords. We're working on being #1. Chris Horne set up Property Hawk in 2006, to combine advice, news and data storage for landlords of residential properties in the UK. I invested in the site in 2008. Chris provides the opinion, Mark Horne runs the business side and I look after the technicalities of the website. The site runs nicely on PHP with a MySql database. There have been three generations of the Property Manager software. We now use a client-side jQuery approach, preserving the server-side intelligence developed in C# for the previous version. There's also a web app edition, making certain functions work on mobile phones. When we formed Welland Media Limited, the three of us lived in Nottingham, rural Derbyshire, and South London. The geographic centre of these locations was in the middle of the River Welland in Market Harborough.